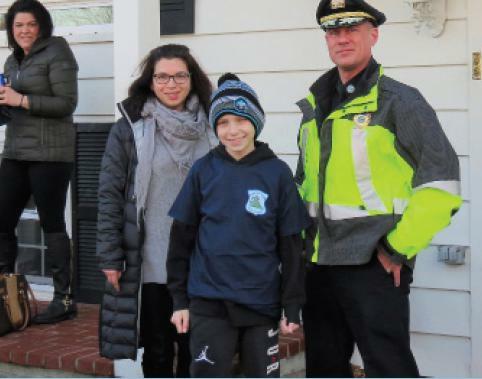 Eleven year old Nathan Scanlon got the ride of his life last month when the North Andover Police and Cops for Kids with Cancer paid him and his family a visit in their Johnson Street home, lights and sirens blaring. Nathan came out of his house to a line of police officers in his driveway, each giving him a high-five before he climbed into the front seat of a police car and led the procession of police cruisers to the police station. “We are here today for an 11 year old kid with cancer,” North Andover Police Chief Charles Gray told The Valley Patriot. Arriving at the police station, Nathan and his family were brought into the back door “this is the door police officers use when we come to work” one officer told him. Once inside, Chief Gray thanked Nathan telling him that the police consider themselves pretty brave “but you are braver than all of us here today, we want you to know that”. Nathan and his family were given a check from Cops for Kids with Cancer in the amount of $5,000 to help them with some of the expenses associated with taking time out of work, travel into Boston for treatment, etc. Stacy Abato, Vice President of Cops for Kids with Cancer told the Valley Patriot that her organization goes through a screening process to select families who have children with cancer. She said that the families of kids with cancer are too often met with unexpected time out of work, transportation costs to and from treatment, and supplies needed at home for the child. Chief Gray and Ed McNelley, a retired Boston Police Officer, also presented Nathan with some presents to brighten his day and talked about the importance of the Cops for Kids with Cancer program. Over the years, Cops for Kids with Cancer has given more than $2.5 million to families with children battling cancer …no strings attached! To donate to Cops for Kids with Cancer go to copsforkidswithcancer.org.